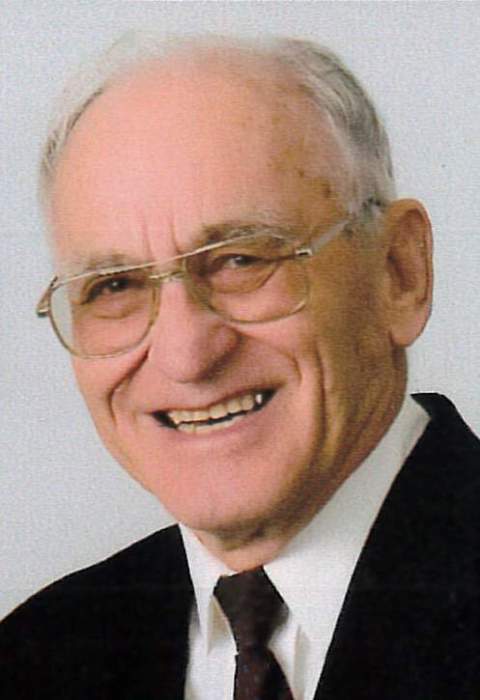 Eugene “Gene” A. Engel, 90 years of age, of Beatrice passed away Monday, April 15, 2019 at the Good Samaritan Society in Beatrice. He was born on March 31, 1929 in Beatrice to Joseph and Grace (Watkins) Engel. Gene graduated from Beatrice High School and married Marjorie Carpenter on April 29, 1950 in Beatrice. He served his country in the United States Army from 1952 to 1954. Gene was a member of the Fraternal Order of Eagles #531 in Beatrice, Beatrice Rural Fire Department, Gage County Fair Board, ASCS, Beatrice Square Dance, 3 G’s 4-H Club and the Mt. Olive School Board. He enjoyed woodworking, square dancing, cards, water skiing, camping, raising cattle, gymnastics and playing in the band The Serenaders. Funeral Services will be held at 10:00 AM Thursday, April 18, 2019 at Harman-Wright Mortuary in Beatrice with Pastor Mark Schutt officiating. Interment will be held at 1:00 PM Thursday, April 18, 2019 in the Evergreen Home Cemetery in Beatrice. Visitation will be one hour prior to funeral services on Thursday. Memorials are suggested to the Beatrice Senior Center or the Alzheimer’s Association in care of the mortuary. Harman-Wright Mortuary in Beatrice in charge of arrangements.